I think that for Maison du Chocolat, 2013 will always be my favourite year. 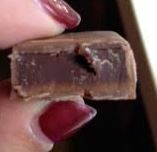 A combination of champagne truffles from different kinds of champagne and delightfully flavoured ganaches (for me) will always be the absolute highlight for me. The beautiful reindeer as the mendicant was absolutely inspired and they much have put in far more work than they were charging for. 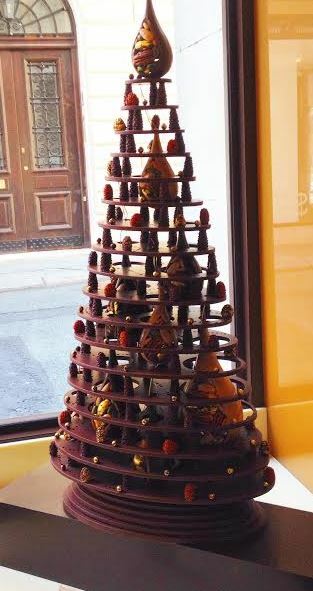 Topping that this year, Maison du Chocolate has brought out a whole new range for Christmas and the most gorgeous tree in chocolate that you could imagine, with chocolate ornaments suspended *winthin* the almost lattice structure. 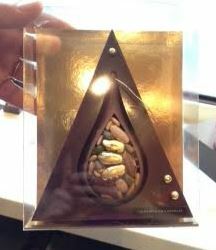 The flavours this year are new and delightful and of course the same high quality you’d expect from Maison du Chocolat. Christmas Ornament – Nicolas Cloiseau presents five new creations with the wonders of winter. Citrus from Christmases past, fruits discovered anew, candied fruits, chocolate almond paste, cacaos with spicy, delicate notes… a new look at the cherished flavours of Christmas. I haven’t ried one but it looks darn impressive. I can imagine one at each place setting at a dinner table or as a special Christmas gift to someone you love. But to the chocolates! Well, this year Maison du Chocolat is going to be an absolute treasure for those who enjoy fruit with their first pure mandarin concentrated fruit jelly, as well as the other delightful flavour combinations that Maison du Chocolat has in store but be FAST! These are limited time only and so you’ll have to get in store sharpish! 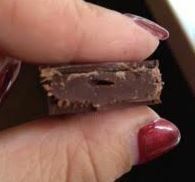 Spicy Cacao – This is not actually flavoured but rather this describes the qualities of the cacao. This is an intense dark chocolate ganache and the beans stand on their own. Given this is all Valrhona not only is the chocolate high quality but it is above all ethical. A dark chocolate, from an exclusive Venezuelan cacao vintage, imparts nuances of its pure origin featuring delicate and spicy Christmas flavours. From beginning to end, the roasted intense cocoa notes reveal an increasing bitterness prolonged by a lovely finish on the palate. Praliné Masquerade – Can’t say I was massively in love with this one – so I’d be more likely to share it 😉 but it was still delicious and if I had a box to myself they would not be left 😉 In the tradition of Yuletide fruits, Nicolas Cloiseau revisits a chocolate classic. Almonds are the mainstay of this traditional praline, scattered with pieces of dates. The frank taste of almond bolsters the sweetness and texture of moist, silky dates. Lemon Bergamot – This was actually really nice. 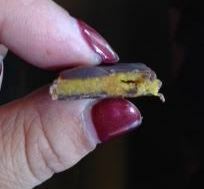 The citrus here really works well in the ganache and it is a delightfully balanced mouth experience. From a selection of delicate wintertime citrus, Nicolas Cloiseau marries hazelnuts with the refined tones of Sicilian Bergamot, enhanced with lemon juice. Crisp light acidulous notes give some panache to this robust praline featuring hazelnuts from Piedmont. 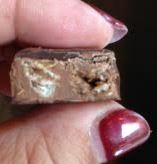 Silky Almond – Again, not a favourite. I might choose to leave these in the box as a way of sharing – steal the ones I love, leave the rest and pretend to be sharing 😉 Continuing the spirit of Christmas confections, almond paste is presented in a chocolate guise. Imagine sweet Sicilian almonds crushed in chocolate fondue… The wonderful chocolate almond paste flavour blends at the finish with notes of evergreen honey. Clementine Square – This was so thin and delightful it stands out most in my memory. Candied fruits have always been a must-have on Christmas tables. A purée of finely crushed candied clementine rinds, accented with candied orange, puts a new twist on this classic. Bite into a very delicate chocolate with silky texture and revel in delightful Corsican citrus flavours. Overall I love this collection. I think if I had to choose a favourite year I’d go with 2013 but this year still has lots of delights including this impossible Christmas Tree. I can’t even begin to consider how amazingly awesome it would be to receive so people – GO BUY ONE because it is exceptional value this year! oh man. You had me at the lemon bergamot! What a stunning collection of chocolates. I don’t thin I have ever tried any of their range but I would go for the lemon bergamot first as I love floral flavours with chocolate. That chocolate tree looks stunning although it’s probably not a good idea in my sitting room near the coal fire!! I am totally coveting those clementine squares. The tree was STUNNING! It has those ornaments floating free inside its structure – I cannot imagine the work involved in creating it. I know £700 seems a lot but it is such a work of art if you compare it to the £1,300 box of Charbonnel which is just a fancy box it just shines as great value!